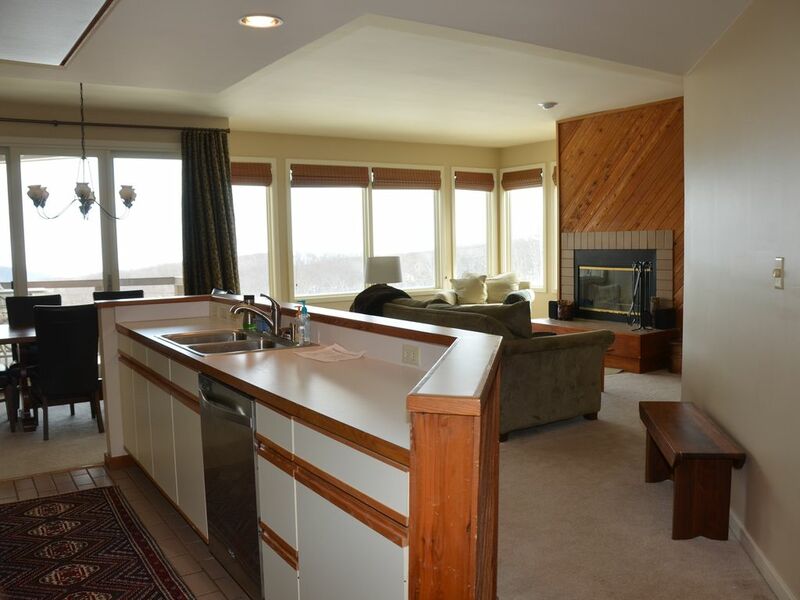 Fully Furnished 2 Bedroom 2 Bath Condo right in the heart of Wintergreen Ski Resort. Master Bedroom has a king bed, flat screen tv with cable, private bath with Jacuzzi tub. Enjoy the private patio right off of the bedroom. The second bedroom has one set of Bunk Beds PLUS a twin bed with trundle to sleep up to 4 comfortably. The kitchen is fully stocked with pots, pans, plates, etc. Enjoy a nice home cooked meal while over looking the slopes or head over to one of the resorts delicious restaurants. After a day of skiing, come back and hang out by the fire in the spacious living room with a panoramic view of the mountains. While the weather was warm and the snow was thin, the views were amazing. One of the most amazing sunsets I have seen on the mountain. The condo was comfortable and easy to access and the coordination with the owner was seamless. We will be staying here again. Thank you! The unit was as described. It is a very comfortable unit for a party of 4 and or a family with 3 children. Chris was very responsive to any questions or concerns. The unit is well equipped. We fixed breakfast every morning and 1 dinner in the unit. The unit is very bright specially in the morning with the rising sun coming directly into the unit. We fully enjoyed our long weekend escape. Relaxing condo with a great view. Very nice condo with a great view and plenty of natural light with all the windows. Blinds were also super easy to operate which is not always the case. There is so much to do both at wintergreen and nearby. We ate at Blue Mountain brewery, Devils backbone and the Mexican restaurant in Nellysford, all were good. Devils Backbone has a place called the summit that serves breakfast Thursday through Sunday, we went twice and it was good also. Hiked Crabtree Falls, spectacular! and did a hike in Wintergreen, lower Shamokin falls, which was a moderate hike with great fall views. There are many more hikes in the area and in Wintergreen as well. We also went to the Virginia Distillery which was fun and quite nice as well. After our daily activities it was perfect to come back and relax at the condo. There is a HDTV TV over the fireplace with many channels including movie channels. Condo has everything you need we did not cook any meals but you easily could. We will be back as there a lot of things to do that we did not get in this trip such as the blue ridge parkway which is a very close by I will be bringing my road bike to log some miles. You will enjoy this condo and your time at Wintergreen. Great Stay, even without snow. We had a nice stay here even though most of the snow was gone. Condo is comfortable and has a well stocked kitchen. The views are awesome. Great location and tons of room! The condo has everything you need! Right on the slopes, easy walk to restaurants, plenty of room, well equiped and a very responsive owner for questions and suggestions. Great Unit in a Great Location! We enjoyed our weekend and the great location on Diamond Hill! This was a great unit and we would rent it again!